If Lake Taupo was a piece of music, what would it sound like? 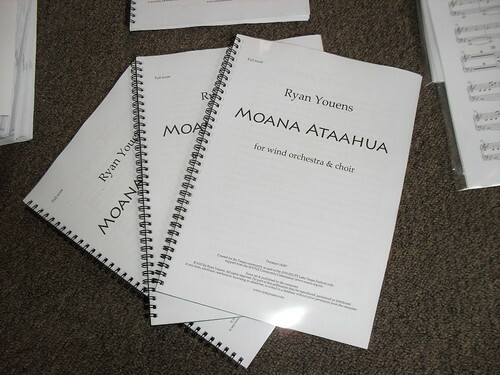 Find that out on Saturday 8th May when Moana Ataahua is premiered at the 2010 ERUPT Lake Taupo Festival. It is written for the Taupo community and commissioned by the SOUNZ Community Commission. Over the last two months I have been writing, writing, writing this piece day and night and finally on Friday it was complete and in the post. We described it in the programme as "a spectacular mix of symphonic, choral and percussive elements that will erupt into an exciting finale" and that surely is what it is. It is 14 minutes in duration and works through various pictures of Taupo as expressed to me by four local poets, whose texts are used throughout the work. The piece will be performed by a 150 strong ensemble ranging from young players to professional players and involves five community groups. It was a joy to write - knowing the players, venue and occasion made the ideas flow nicely. Rehearsals are underway and in the next week or two I may go down to help out and see how it is all going. 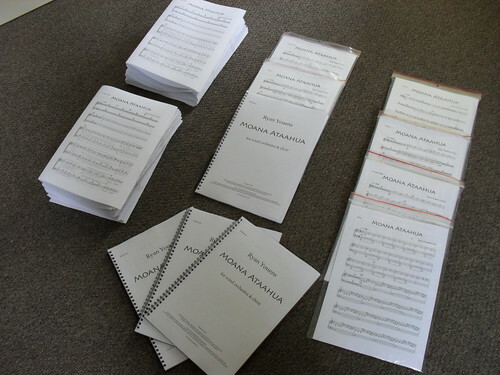 Here is the huge amount of music printed and prepared for each ensemble, and all set for the post.